We often receive inquiries from individuals interested in learning our craft. The enthusiasm is appreciated. Following are the most common questions that we get asked. The knowledge of Japanese Carpentry is traditionally passed on through one-on-one apprenticeships. An aspiring novice will usually seek out a personal introduction to an accomplished carpenter, then wait, if necessary, for the opportunity to participate in his daily work. In the old days that sometimes meant just hanging around sweeping the floor or helping stack wood, being a ready eager extra hand. When the carpenter was satisfied with the young students’ commitment, then he would begin to give some unimportant tasks to accomplish. Rudimentary tools and basic instruction of their use would be provided. As experience and familiarity with the tools was gained, he was allowed to approach more involved work. Generally the methods of teaching are not overt. It is said that the student must “steal” information. That is, when he has tried and failed at something, then truly ready and eager to learn, the teacher will allow an opportunity for the student to see how it should be done. But nothing is said and the student can’t just stand and watch. He must sneak a look while still busy with his designated task of the moment. Little or no pay was received until the apprentice could produce useful work. Most often nowadays an apprentice is also an employee. That adds other parameters including at least minimum wage payment. This can affect the dynamic, but if the teacher and the apprentice are in agreement, much of the traditional teaching can still be followed. What’s it like learning Japanese Carpentry? The training is threefold. First, physical: Hand tool techniques are developed through a lot of repetitious practice. Soon one’s body changes, new muscles grow, balance and core strength expand, the senses become attuned to the rhythms, look and feel of the materials and tools. Overall strength grows also. Carpentry is a practice of building structures, many of which are homes or shelters. Much heavy lifting is involved. 50 to 100 lb. pieces of wood are common and some are much more. Sometimes these pieces must be maneuvered while perched on ladders or scaffolding and enduring all types of weather conditions. Hand work means your muscles move the tools. Even if power tools are used, most electric carpentry tools are hand operated, so even those require muscle, balance and skill in use. All of this to say that the work is fundamentally very physical. There are also many aspects to construction beyond woodworking. At least occasionally a carpenter is called on to work with metal, stone, earth or paper, and all sorts of modern materials such as concrete, sealants, adhesives, insulation, pipes and wires. Each material requires adapting to specialized tools and techniques, developing the skills to work with and understand whatever the project requires. Second, Mental: One of the biggest challenges in pursuing Japanese carpentry can be having the will to embrace all of the teaching. Often this means giving up many previously set ideas and habits. Naturally this is most difficult for someone who is already accomplished at another type of carpentry. But even a complete novice might carry a preconception or pride that gets in the way. The approach to working within the world of traditional carpentry is so very different that one must really start from scratch. Cultivating the ability of spatial visualization is also necessary. In order to construct with wood, a plan must first be built in the mind. Comprehending the complexity of jointery and structure in traditional construction will challenge even the sharpest of intellects. Again repetitious practice, seeing the same thing over and over makes it understandable for most people. Third, Emotional: Many will be surprised to find how emotionally challenging it can be learning in a traditional way. Most aspects of the work can be seen or conceived by the mind and yet lack of experience and skill stands in the way of accomplishing it. Often one becomes his own harshest critic. Also a great deal of focus and concentration is required to comprehend the multiple complexities of the work and accurately carry out the tasks. For the first few years one is drawn into the depths of this new world of apparently limitless refinement. Encountering challenges daily, it can be necessary to reach deep inside for the strength to continue. Eventually one becomes accustomed to the demands. The skill and strength grow and then the real joy in practicing blossoms. One finally begins to relax with confidence that truly unique and special objects can be fashioned. Because of the dedication required to get through the training, in Japan it is traditionally recognized that among all craftspeople, carpenters are due the highest level of respect. Unlike Western apprenticeships, there is no formal structure and no set time to a Japanese apprenticeship. In the old days 5 years would be considered a minimum, but now often 3 years is accepted. In reality it depends on each individual and both the teacher and the apprentice will know when enough training has occurred. Of course being free from other obligations and responsibilities makes the apprenticeship choice easier. Starting out young is best. First there will be less to unlearn. Second, since the training can easily take 5 to 10 years, starting out in later years might not allow much time to put the skills to use. If one is over 30 or 35, it becomes a questionable investment in time for both the apprentice and the teacher. Anyone can see that carpenters are almost always male, even here in the U.S. The reason could be partly a male ego thing or simply social stigma. This situation is thankfully changing, albeit slowly. Even in Japan where old school gender roles still dominate, one can occasionally see women in construction. Probably the main reason is that it’s a very unusual woman who would choose to devote herself to heavy, physically demanding repetitive tasks typical to Japanese carpentry. That includes squatting for hours, staining your hands black while honing tools and, when starting out, maybe succeeding at getting a sharp edge. That said, if you are a woman with such motivation, by all means go for it. Usually a master carpenter who is truly accomplished will gladly share his or her knowledge with anyone who is dedicated enough. How to find an apprenticeship in Japanese Carpentry? First find an accomplished carpenter that you aspire to learn from. Here in the U.S. there are relatively few who have had formal training. Perhaps a dozen or so. Most are on the coasts, with California having the highest concentration. When the builder has a major project such as whole house construction, then there might be a chance to get on board. In that situation there is enough volume of non-critical work to keep a new apprentice busy. Being connected with such a carpenter at the right time is the key. In Japan of course there is much more opportunity to be involved in continuous carpentry work. Since this is the standard form of residential construction there, all levels of quality are found. 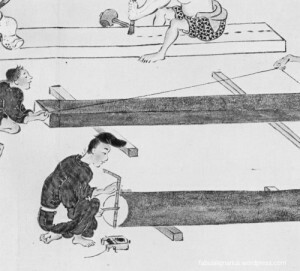 The challenge can be connecting to a Daiku (carpenter) that is devoted to the type of work that you will be inspired with. Again, the best approach is finding a way to get a personal introduction to such a Daiku. Be respectful of their working space. Most Japanese carpenters work quiet and concentrated. If you must intrude during working hours, go at break-time (10:00am or 3:00pm) or lunchtime (noon). Bearing some small gift is always a good idea. Please learn at least rudimentary Japanese language before seriously attempting to contact a carpenter in Japan about an apprenticeship. What alternatives are there to a Traditional Apprenticeship? Many people are self taught woodworkers who find great satisfaction in what they do. The huge advantage of a traditional apprenticeship is inheriting volumes of experience from countless generations that are embedded in a proven methodology. It’s an evolved knowledge that works, even if it defies ready explanation or understanding. Therein lies the difficulty of acquiring this knowledge in a different format. Most carpenters who have gone through an apprenticeship never needed to clearly explain what they do. They just absorbed it and do it. If you can find an accomplished carpenter who is willing to try explaining or, better yet, somewhat experienced at teaching, then at least some information can be gleaned. Of course any opportunity to work in a shop dedicated to traditional work will be worthwhile, even if it’s not a full, long term apprenticeship. But please realize that any training is an investment in time for your teacher regardless of the situation. Formal Internships are virtually unknown in the world of Japanese Carpentry. Attending an intensive course of dedicated teaching would probably be time better spent. In Japan, Trade schools covering traditional crafts were until recently unimaginable. Now though, few young people are entering the trades and the work environment has evolved to where little time is allowed to practice foundational skills. Therefore, recently some trade schools have sprung up. At least one in Kyoto offers courses in traditional construction related trades such as door making and clay wall plastering. So far it’s all in Japanese. Books with substantial information are few and none are comprehensive. There are more in Japanese than in English, but the fundamental difficulty is that to be comprehensive involves far too many details than any book can tackle. As with any subject, the internet abounds with opinions and some helpful information, along with a lot of confusion. No doubt over time more varied opportunities to learn will develop, but for now, most people explore all of what is available piecing together information and form their own unique blended style of working.